Thursdays will be Tasty Thursdays for now on. At least here on my blog. I like to cook and bake. Making and baking meals is just wise thing to do. At least I think so. That’s how I know exactly the ingredients of the meal and I can choose which kind of products I use. Tasty Thursdays idea is just to share a recipe of the whole meal or just one tasty thing that I’ve made during the week. Recipes could been shared any other day too, but Thursdays is one day that is certain. I know I just wrote that recipe would be one of the things I cooked this week, but I don’t have a photo of any of the meals I’ve been eating during the week. This dish was made about two weeks ago, and it was soooooo good. This recipe is for 3 persons. Prepare the salmon: pluck the salmons back bones and cut it to the portions. Prepare the sauce by mixing all ingredients together. Turn over the salmons in the sauce and leave them to marinate for about half hour. Lift the salmons to the baking tray, leave rest of the sauce in to the bowl. Pre-heat the oven to the 175’C (347’F) and roast the salmons 10-12 minutes. After that put oven to the grill mode and increase the heat well. Grill salmons about 5 minutes now. After they’re done stroke more sauce on the salmons. 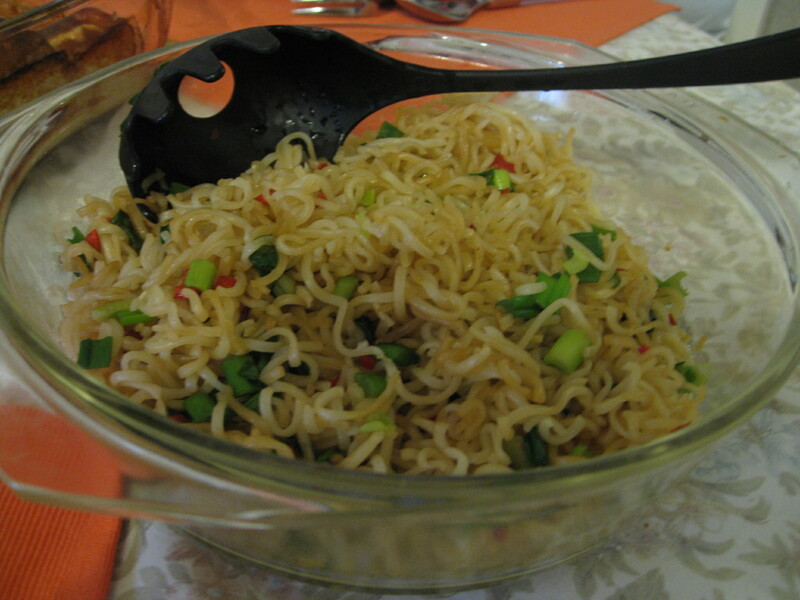 Cut the noodles in to the smaller pieces (it’s easier to fry them). Prepare the noodles as it’s been said on the package. Pour the water out and leave the noodles for a minute or two. Pre-heat the pan and about 1-2 tbsp vegetable oil, add the chopped red pepper and fry for a moment. Add noodles and fry about 3 to 5 minutes. Add chopped green tops of the spring onions, sesame oil and soy sauce. Fry just one minute more. This was quite easy to cook. Next time I’ll chop two red peppers in the noodles, because it wasn’t spicy enough for me. And I don’t like spicy food, so it wasn’t spicy at all. 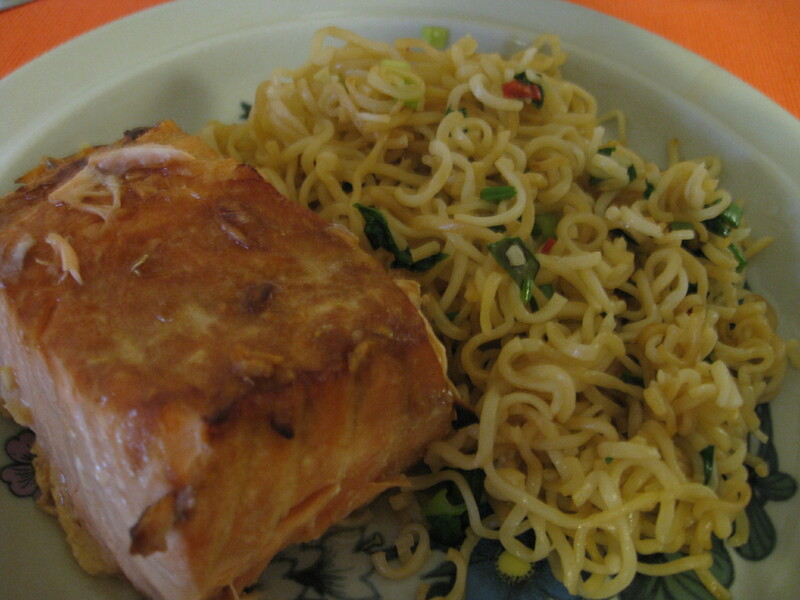 I found this recipe from one blog I found while looking for Asian style cooking with a salmon. The blog is called Hahmakettu. The blog is in Finnish, so visit it if you know the language.